Your tree’s overall health is important to you, and Wichita Tree knows that! That’s why we offer tree cutting services which are meant to only cut certain limbs or branches from an otherwise healthy tree. This procedure can enhance the aesthetic quality of the tree, protect nearby structures and keep the tree growing strong! The professional staff of Wichita tree is trained to assess the current status of the tree’s health, communicate that information to you, and then work with you to make a plan about which parts should be cut in order for the tree to continue to grow successfully. In the event that tree cutting will not be enough, we will inform you as soon as we determine that a tree needs to be removed. One of our crew members, wearing a harness and connected to a rope safety system, will climb to the limbs that need to be removed. Beginning at the crown and working their way down, they will remove the agreed-upon limbs. If the tree is in an open area, they will drop the limbs down to a clear area to be collected later. If the tree is situated near an object like a house, fence or outbuilding, the technician will gently lower the branches to waiting teammates below. 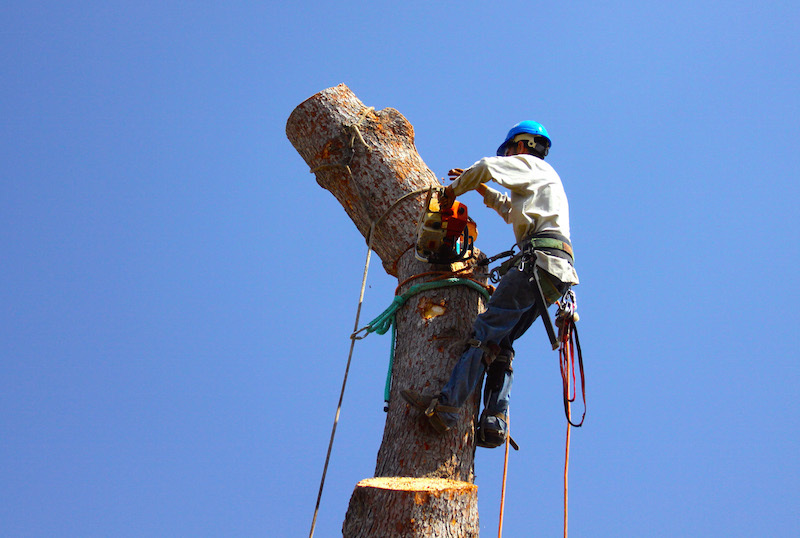 ​As with total tree removal, when Wichita Tree performs tree cutting services, we make sure to start from the very top of the tree and move carefully down one section at a time. This method allows us to control every aspect of the removal process. When we are finished, you will have the option for us to process the unwanted limbs through our wood chipper on location so you can use the chips as mulch in your flower beds and other landscaping. We can also chop the branches into small pieces for you to use as firewood in your indoor or outdoor fireplace. If you opt not to do that, we can always haul the limbs away for you. It’s your choice! Taking care of your trees by tidying them up a bit can save you major dollars and headaches later on. Let us perform some minor tree cutting now so the entire tree doesn’t have to be removed later! Call Wichita Tree today for a free estimate on our tree cutting services! For a free estimate today on what it will take to clean up your treescape, give us a call at 316-226-8733!